Gaiam’s Yoga Mat Towel is an extra absorbent and fast drying towel that is deal for hot yoga and traditional practice. 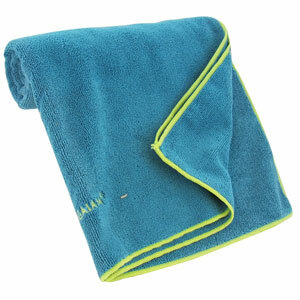 The microfiber is hypo-allergenic, non-permeable, and dries in half the time of ordinary towels. Mat is sized to fit directly on top of your yoga mat. Easy-care blend of 88% polyester, 12% nylon. If you enjoy hot yoga sessions, or even if you just sweat a lot – meet your new favorite yoga accessory: Gaiam’s Thirsty Yoga Towel. Designed for Ashtanga, vinyasa and hot yoga, our super-absorbent, microfiber mat towel fits on top of a standard yoga mat, wicking away moisture and drying in half the time of a cotton towel.